*** WE RECOMMEND REQUESTING FREE COLOR SWATCHES PRIOR TO PURCHASE, CALL US FOR THESE AT 727-481-1752, E-MAIL AT sales@uptoparcovers.com, OR SEND US A MESSAGE VIA THE AMAZON MESSAGING SYSTEM AS COLOR CHART VINYL MAY NOT APPEAR THE SAME ON YOUR COMPUTER SCREEN *** Up To Par Covers quality custom made golf cart seat cover sets made to your specifications. Set includes front seat and backrest cover(s) and rear seat and backrest cover(s). Made with marine grade vinyl, assembled with UV ray resistant thread to help prevent deterioration from the sun, and top stitched for added strength and support. Sewn in seat and back sides for a better fit. 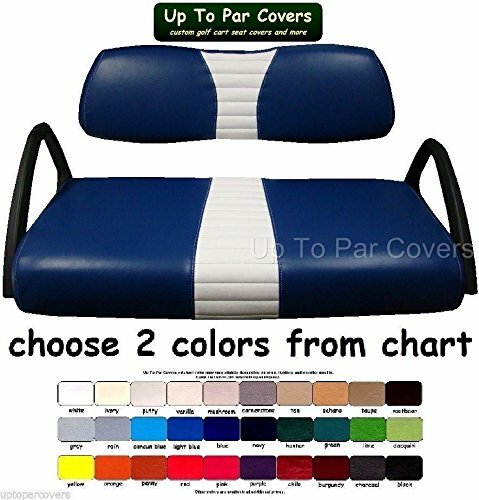 Please provide the information required for rear facing seats by sending them to sales@uptoparcovers.com, calling us at 727-481-1752, or via the Amazon messaging system. Failure to provide this information will result in failure to complete and ship order. *** TERMS OF SALE Please ensure this product description matches your cart model / seating prior to purchase. Our products are created for factory / stock items only, as they may or may not fit aftermarket items. Suggested installation instructions will be included. Computer generated colors may vary from actual colors due to monitor, lighting, etc. Swatches may be requested and mailed prior to purchase at no charge. Returns not accepted except for manufacturer defects only when reported within 7 business of receiving item. Returns NOT accepted for color choice. We are not responsible if any incorrect information is provided by consumer. Detailed tracking information may not be available for international orders. Transit time and charges will vary for all international orders. If you have any questions about this product by Up To Par Covers, contact us by completing and submitting the form below. If you are looking for a specif part number, please include it with your message.